High surf along Sunset Cliffs on July 24, 2009, captured by Jim Grant. 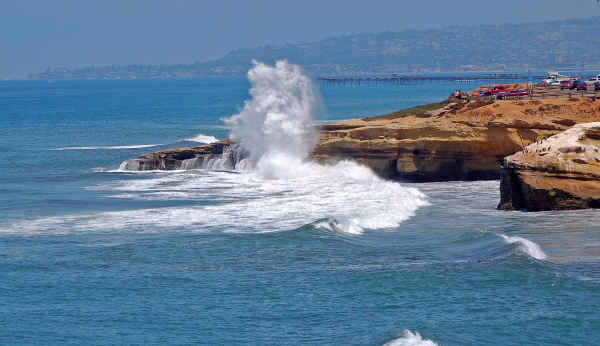 Editor: In response to our recent post, “Sunset Cliffs – and surf culture – in danger of erosion” by Mary E Mann on July 20th, we have received the following article by Ann Swanson, current Chair of the Sunset Cliffs Natural Park Council. The article on Sunset Cliffs is filled with misinformation and distortions. I welcome the opportunity to give the facts about the unique Sunset Cliffs Natural Park, the planning process, the approved Sunset Cliffs Natural Park Master Plan, the ongoing Comprehensive Drainage Study, and any other issues of concern about Sunset Cliffs. The community needs to work together to preserve beautiful Sunset Cliffs! The public might find the following facts interesting. The Sunset Cliffs Natural Park Council (SCNPC) is the City’s officially recognized advisory committee for Sunset Cliffs Natural Park. The SCNPC meets at 6:45 p.m. on the first Monday of each month (the 2nd Monday when the first falls on a City holiday). Meetings are held at the Cabrillo Recreation Center at 3051 Canon Street. Currently, the SCNPC has 32 members (14 men and 18 women). In 2008 the City required all councils to update their bylaws to comply with the City’s new Standard Operating Procedures (SOP). Unfortunately, the new SOP established a membership limit of 25. After pleading with Park & Rec officials to let us keep our prior policy of unlimited membership, Park & Rec made the concession for the SCNPC to have a limit of 35 members. The public is welcome at SCNPC meetings and their input is encouraged. Park & Recreation Department staff members addressed the bench issue at the June SCNPC meeting. As Councilman Faulconer stated in his letter to the Beacon, he requested that the City’s Risk Management Department study Sunset Cliffs from a risk management perspective after a woman fell to her death. It was Risk Management who determined that the guard rail benches presented a potential risk factor, a decision unknown to the SCNPC until after the benches had been removed. In June the SCNPC voted to recommend re-installation of the guard rail benches which had been removed along Sunset Cliffs Boulevard. (The statement that the SCNPC “was behind the push to remove the benches” is totally false. To create controversy out of agreement certainly seems counterproductive.) It should be noted that although the SCNPC voted to re-install the benches, the SCNPC is only advisory. The City is the final decision maker in all matters relating to Sunset Cliffs. The Sunset Cliffs Natural Park Master Plan, which received broad based community input and was officially approved in 2005, serves as the official guide for Sunset Cliffs Natural Park. The Sunset Cliffs Natural Park Master Plan is essentially a preservation plan which addresses drainage, native habitat restoration, a protective trail system to minimize human caused erosion throughout the park, etc. I was disappointed that Richard Aguirre was quoted in the OB Rag as crediting the SCNPC with goals which are contrary to the master plan. An example is his statement that the SCNPC plans to make the boulevard one way. Not true! The master plan specifically calls for maintaining Sunset Cliffs Boulevard as a two-way street. Another example is the statement that the goal is to get rid of all parking lots. Also not true! The SCNP Master Plan does not call for getting rid of all the parking lots and would never have been approved by the California Coastal Commission if it had. The Sunset Cliffs Natural Park Master Plan can be accessed at the City’s web site here. The Sunset Cliffs Natural Park Master Plan clearly reflects the concern about unnecessary erosion in the park by specifically calling for implementation of a new on-site comprehensive drainage plan for both the hillside and linear sections of the park. The first step is a Comprehensive Drainage Study for both the hillside and linear sections which is being done by Dudek and Associates under the direction of City Engineer Paul Jacob. An initial large community meeting was held by Dudek to share information about the study process & gather preliminary community input. A second community meeting will be held to share information on alternatives which were developed from the study and to receive community response and constructive input. After completion of the study, one of the alternatives will be selected by the City and new consultants will be hired for designing engineering plans for the designated projects and necessary environmental review. After funding is obtained, implementation of the selected drainage plan will proceed. It is my hope that the community will join together in support of the important process of implementing the protective Sunset Cliffs Natural Park Master Plan. Thank you for the clarification on these issues. Beach erosion is very complex something I do not fully grasp. One thing I do grasp is the beauty we have at The Cliffs. I appreciate the passion Mr. Aguirre has however passion without facts can diminish your impact. Once the draniage study is complete I am sure the SCNPC will benefit from his passion to preserve the Cliffs. Ann, I’m curious where the SCNP begins. I’m guessing it starts after Point Loma Ave near the Sunset Cliffs Inn. Because the area from the pier to Orchard street (which I still consider Sunset Cliffs) is an absolute disgrace! I could seriously care less about some benches, but that seems to be the hot topic around your circle. What about the rampant drug use, graffiti, defecating in tide pools, trash strewn all over the cliffs and beaches, homeless encampments and destruction taking place less than a mile away from where your organization is crying over a few benches being removed??? With a committe of 35 people! Surely you must have some that would like to get involved in actually doing something about the problems I’ve mentioned, or is it more of an “out of sight, out of mind” thing? Perhaps it’s just me, but I think it’s a shame that a group of 35 people can get together for a meeting and pontificate over the removal of a few benches, and completely ignore serious crime and destruction happening blocks away. Jon, The north entrance to SCNP begins at the corner of Adair Street and SC Boulevard. The total acreage of SCNP is 68 acres with the linear section to the west of SC Boulevard between Adair & Ladera containing 18 acres and the hillside section south of Ladera Street containing 50 acres. The SCNPC only has advisory jurisdiction over SCNP, not the surrounding area. Whenever any SCNP issues arise, the SCNPC has an obligation to obtain community input and make recommendations to the City. That is what has happened with the bench issue after the City’s Risk Management declared the benches to be a risk to the City. Councilman Faulconer and Park & Recreation asked us to study the issue and make recommendations. The SCNPC shares your concern about illegal activities in the park and spends considerable time at each meeting addressing these issues. Fortunately, Police Officer Surwillo attends SCNPC meetings, hears concerns, and updates us on police and safety matters. The Park and Recreation Department spends a tremendous amount of time picking up trash, taking care of grafitti, and fixing the many problems as they arise. We also sponsor clean up parties. Unfortunately, the litter problem is ongoing. We would welcome effective solutions. Please feel free to join us at meetings of the SCNPC. Thanks! Funny, I’m down there weekly and don’t see anyone else painting out graffiti or picking up trash. Although that was a nice tidy political answer, I’m just not buying what your selling. We had a clean up party a little over a month ago. It was advertised heavily on the rag. Nobody sponsored anything. Should we call you next time? Will you donate supplies and extra people? It was just locals coming together with their own money, time and resources (the city did generously donate paint for us). The area had been completely neglected for months. You can see pictures of what it looked like before the volunteers that came out that day cleaned it up. I can propose an effective solution right here…send some people down there with trash bags and paint and clean it. Daily. I’m just one person, and there are a very small handful of others that go down there to clean, but it’s not enough. With a dedicated organization of 35+ people, you should be able to keep it virtually spotless down there. Sorry if I sound a little harsh or accusatory, but I’m getting burned out on my own and would appreciate extra help. I’m sure there are a lot of good things your organization does for OB. But I don’t believe one of them involves picking up trash and painting over graffiti. I will try to be at the next meeting. Thanks for all you are doing to pick up litter and paint over the graffiti! That’s impressive. I’d be interested in seeing your before and after photos. We’re all volunteers who care about Sunset Cliffs. When I walk Sunset Cliffs, I always carry a trash bag for litter…. and I always find lots. Keeping the park spotless would be an enormous (probably impossible) task but it is important to keep working at it! Do let me know when you organize another work event so that we can help get out the word. I for one am willing to help. Maybe the SCNPC can keep us all up to speed via this web site….. I am at the Cliffs everyday taking photos or just taking in the views and pick up others trash as well. Mr. Aguirre has a lot of passion for the Cliffs I am sure he could rally help as well. Please Ms. Swanson use this site or OBMA to solict help. Thanks for your willingness to help and your suggestion to use this site or OBMA to solicit help. Great idea! Thanks, too, for your wonderful photo of the Cliffs! I didn’t actually take any after photos. But I assure you…it’s a lot better. I’ll get some up soon. Thanks Ann. I realize we are all on the same team here, and I apologize if my earlier posts come across harshly. It’s nice to have an organization such as yours here. It’s unfortunate however that the park “officialy” starts at adair st. Because that leaves the area of sunset cliffs that REALLY needs attention without a representative body. There seems to be a lot of confusion with the city and their park and rec department over who is responsible for “the wall.” It’s like a hot potato that nobody wants to get stuck with, and I don’t blame them. It’s dirty and requires a lot of elbow grease to get anything accomplished. But thanks to groups like yours and the OB Rag, we can start really raising awareness around the community that this area of our cliffs is in need of help. I agree with every word. And you are doing a good job acheiving your mission. Now we just need to find a way to extend that dedication about a mile north. Because the effects of man are evident in the pictures I shared previously. The tide pools in that area are all but dead. Defecating in tide pools? I thought we just had special little brown legless crabs. Ladies and Gentlemen, don’t forget OB comedy tonight at Winstons! lol. Thanks for the laugh Steven. You’re welcome. BTW the crab boil @ my house has been cancelled due to a kind of crappy situation. I’m pretty sure it was only a Baby Ruth bar, but I digest…. We can talk with the Park and Rec Department about protective and/or educational signs for the tide pool areas. P&R is quite responsive and has an excellent sign department. If you’re coming to the SCNPC meeting tonight, please mention this issue under “Communications”. – This will be a great opportunity since several P&R staff who are involved with the entire SD shoreline will be in attendance! I can not make that meeting, I have a prior meeting. In this matter : Maybe if the Life Guards would drive towards the tidepools at the foot of the pier and notify anyone via loudspeaker …that might do it. Thanks Ann for this. The Save Sunset Cliffs piece was intended as a profile of the Save Sunset Cliffs organization and Richard Aguirre, as a prominent OB citizen and extremely interesting guy. It is not an indictment of any organization or group. However I don’t know if representing one persons opinion is misinformation, as you say – everyone has their own story about how things are, and Richard and his organization felt very strongly about the benches and about their lack of say in the meetings. I am very interested to see how all this progresses. Ann, I know this is an old posting but I wanted to get involved with the SCNPC please let me know detail on meetings so I can learn more about our wonderful park.